These London hotspots are topping the list of interior game changers. With new developments progressing and inimitable heritage buildings and properties being refurbished every other day in London, we thought it was time to peruse some of the capital’s most outstanding designs. 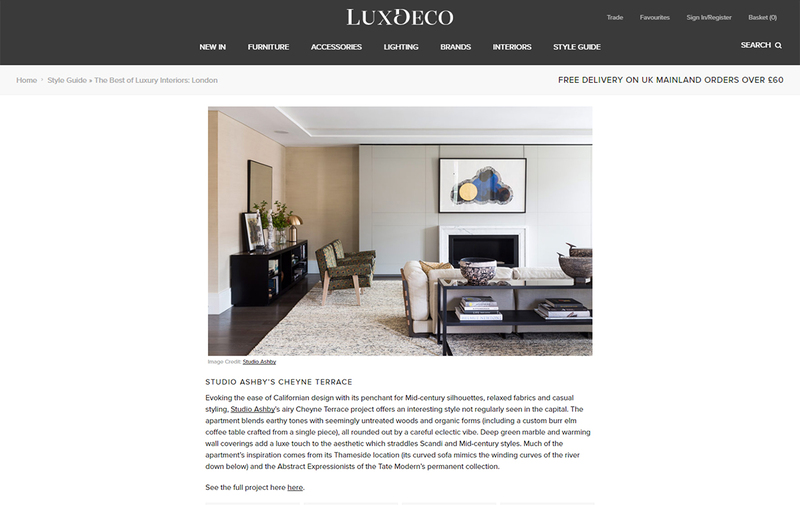 Here we bring you our pick of amazing luxury interiors in London and the top interior designers that made them happen. Evoking the ease of Californian design with its penchant for Mid-century silhouettes, relaxed fabrics and casual styling, Studio Ashby’s airy Cheyne Terrace project offers an interesting style not regularly seen in the capital. The apartment blends earthy tones with seemingly untreated woods and organic forms (including custom burr elm coffee table crafted from a single piece), all rounded out by a careful eclectic vibe. Deep green marble and warming wall coverings add a luxe touch to the aesthetic which straddles Scandi and Mid-century styles. Much of the apartment’s inspiration comes from its Thameside location (its curved sofa mimics the winding curves of the river down below) and the Abstract Expressionists of the Tate Modern’s permanent collection.